Beautifully engraved specimen certificate from the Hammermill Paper Company printed in the 1920's. This historic document was printed by the Republic Banknote Company and has an ornate border around it with a vignette of an eagle. This is the first time we have seen this certificate. Hammermill was founded in 1898 as the "Ernst R Behrend Company." That same year, construction was begun on our first paper mill in Erie, Pennsylvania. In early 1899, before construction of the Erie mill was completed, Ernst Behrend changed the company name to "Hammermill." It was named after the pulp and paper mill in Germany owned and operated by his father, Moritz Behrend. The German mill had been built on the site of an old drop hammer forge used to rework scrap wrought iron. Locals referred to the original site as "the Hammer," thus the name "Hammermill." Over the years, the company expanded. 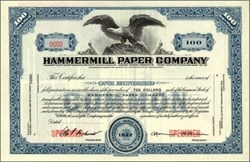 In 1928, Hammermill acquired 40% of the newly incorporated Grays Harbor Pulp and Paper Company in Hoquiam, Washington. The addition of this mill allowed Hammermill to service the growing west coast market more efficiently and economically through reduced shipping costs. Hammermill expanded its mill base again in 1959 with the acquisition of the Oswego mill in New York. For many years this mill made copier paper that was packaged exclusively for Xerox. Today, Oswego is dedicated to producing recycled Kraft paper. The company continued its growth in the 1960's with the purchase of the Lock Haven, Pennsylvania mill in 1965. Its 150,000-ton capacity raised the company's papermaking potential to half a million tons. Also in 1965, construction began on the Riverdale pulp mill near Selma, Alabama. At this facility in 1986, construction of the world-class #15 paper machine was completed and in 1995, the bigger and faster #16 machine was added. A new chapter in Hammermill's history began in 1987 when it was acquired by International Paper Company. This gave Hammermill vast resources to draw on that were far beyond what was available before. In 1988, customer service and operations were moved to International Paper's operational headquarters in Memphis, Tennessee where they remain today. A major reason for the growth of Hammermill is that ever since it�s founding, the company has had a history of being innovative, market-focused and customer driven. A major innovation in papermaking technology occurred in 1952 when Hammermill developed the neutracel pulping process, allowing us to be the first to make fine papers from hardwood pulp. Papers produced using this process combined the benefits of a high quality printing surface using hardwood with the durability previously only available using soft pulp. In 1954, a cooperative venture with the Haloid-Xerox Company paid off when they created the first xerographic copier papers. In the 1980's, a new way of imaging on paper was emerging - laser technology. Once again, another first - in 1986, Hammermill was the first to market laser paper.